Download "The Financial Aid Application Process and Frequently Asked Questions"
2 Complete the FAFSA Renewal Application if mailed to you by the U.S. Department of Education. Applications may be mailed to: Federal Student Aid Programs, P.O. Box 7001, Mt. Vernon, IL Please make sure you list Atlanta Metropolitan College s school code, '012165', on the application so that your FAFSA can be downloaded into our system. Contact the Financial Aid Office to check on the status of your application. At least two weeks after applying for financial aid. DO NOT WAIT UNTIL registration to check on your financial aid status. Financial Aid Deadlines To ensure that financial aid funds are available to students to pay their fees at registration, the Financial Aid Office must receive the FAFSA information and any other required and requested documents by the following deadlines: Fall Semester: June 1st Spring Semester: October 15th Summer Semester: March 1 st What Is Completed Financial Aid File? A student's financial aid file must consist of the following items before aid can be awarded: A valid FAFSA received by the semester s deadline date that does not have to be corrected or correction has been made by the deadline. *A Rejected FAFSA is not valid. If required, the appropriate years signed federal tax returns and verification worksheet. Any other requested documents submitted by the deadline. Officially accepted for admissions to the college; all documents and records submitted to the Admissions Office by the financial aid deadline or currently enrolled in good standing and meeting the Standards of Academic Progress Policy at Atlanta Metropolitan College. Financial Aid Awards Once a student has submitted all of the required and requested documents their file will be reviewed for accuracy. If the data reported on the FAFSA does not agree with the documents submitted then the FAFSA will be corrected. Once corrections are received by the Financial Aid Office a financial aid award letter will be mailed to the student. Special Note: It is important that you use the appropriate year s tax return and other financial documents to complete the FAFSA. Errors will cause a delay in the awarding of your financial aid and funds being available at registration. Financial Aid Helpful Hints Apply for financial aid as early as possible but not before January 1st. It is recommended that you use the appropriate year s tax return and other financial documents to complete the FAFSA. Doing so will reduce errors and the delay of your financial aid award. Make sure you apply for financial aid by the established deadlines. Remember that the fall semester always starts a new financial aid year and therefore you will need to reapply for financial aid. 3 Keep copies of tax returns and other financial information used to complete the FAFSA. Read the FAFSA or Renewal form instructions first to determine what documents you need to complete the form. If applying online be sure to either print off the signature page, sign and mail it immediately to the address given or sign the application by using your Personal Identification Number (PIN). Once your FAFSA is processed you will receive a Student Aid Report (SAR). When you receive your Student Aid Report (SAR) either by or in the mail, read the comments. Keep the SAR for your records. 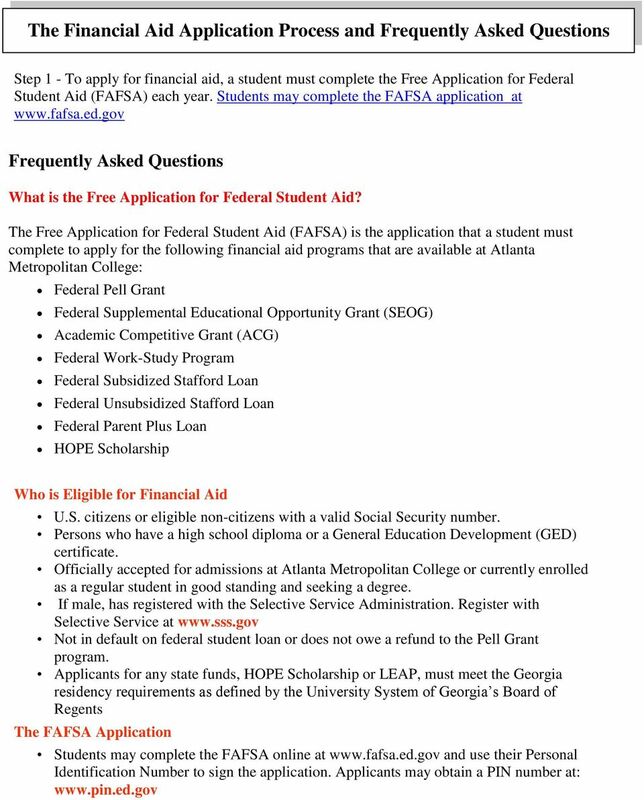 Atlanta Metropolitan College will receive this same information electronically if you listed the school code on the FAFSA. If corrections need to be made to the SAR please make the corrections and bring the SAR to the Financial Aid so that the corrections can be made electronically. Also please make a copy of tax returns and other financial documents and submit them to the Financial Aid Office with the SAR. 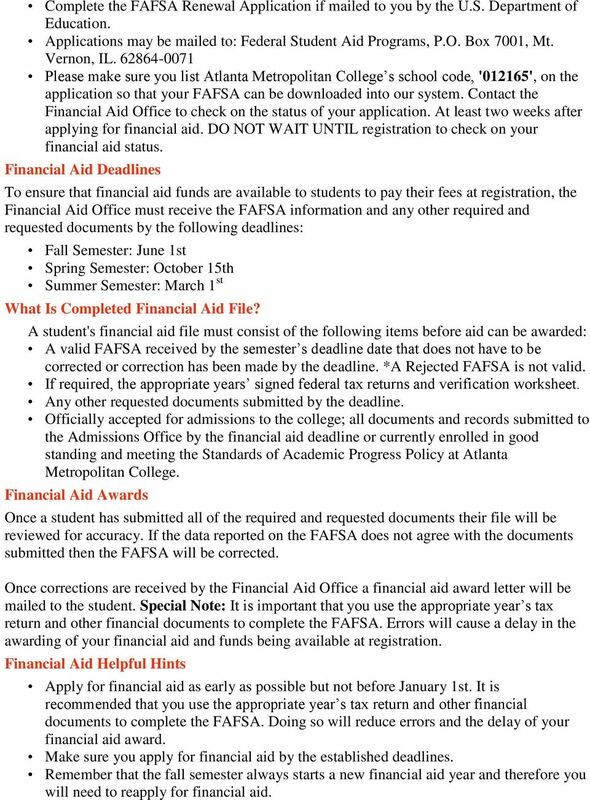 After submitting your FAFSA please check to make sure that the Financial Aid Office received your SAR electronically. If you are a new student to Atlanta Metropolitan College check with the Admissions Office to make sure they have received all of the required documents needed from you to be officially accepted to the college. Check with the Financial Aid Office frequently regarding the status of your financial aid file or until you receive an award letter. Student loan applicants must complete a FAFSA and have a completed Financial aid file before they can apply for a Stafford Loan. The student must also complete a separate loan application. 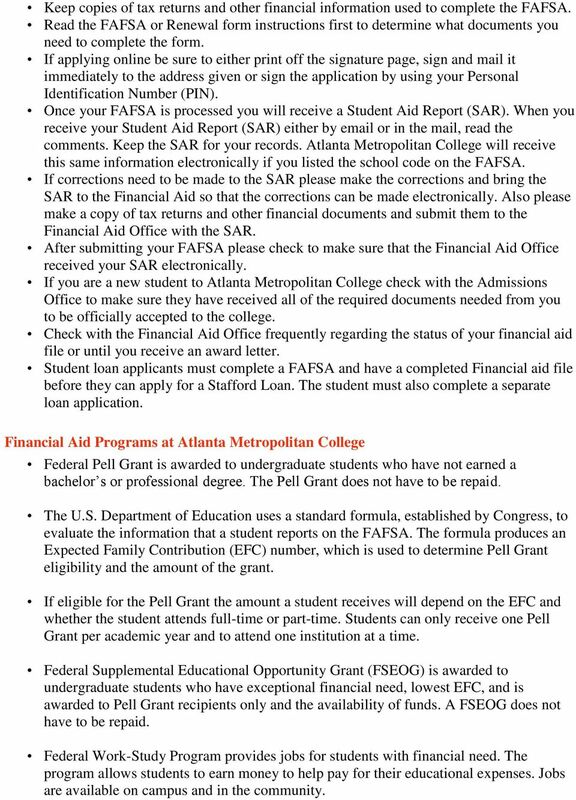 Financial Aid Programs at Atlanta Metropolitan College Federal Pell Grant is awarded to undergraduate students who have not earned a bachelor s or professional degree. The Pell Grant does not have to be repaid. The U.S. Department of Education uses a standard formula, established by Congress, to evaluate the information that a student reports on the FAFSA. The formula produces an Expected Family Contribution (EFC) number, which is used to determine Pell Grant eligibility and the amount of the grant. If eligible for the Pell Grant the amount a student receives will depend on the EFC and whether the student attends full-time or part-time. Students can only receive one Pell Grant per academic year and to attend one institution at a time. Federal Supplemental Educational Opportunity Grant (FSEOG) is awarded to undergraduate students who have exceptional financial need, lowest EFC, and is awarded to Pell Grant recipients only and the availability of funds. A FSEOG does not have to be repaid. Federal Work-Study Program provides jobs for students with financial need. The program allows students to earn money to help pay for their educational expenses. Jobs are available on campus and in the community. 4 To apply for Federal Work-Study a student must have a completed financial aid file and complete a separate application for employment. Applications are available in the Financial Aid Office. Federal Subsidized Stafford Loan is a need based loan program. Federal regulations require that a student complete a FAFSA before they can apply for. A Subsidized Stafford Loan. Students are also required to complete a separate loan application, and a Master Promissory Note, which is sent to the student by the lender. Students receiving the Subsidized Stafford Loan are not required to make payments on the loan and there is no interest accumulating as long as the student is enrolled on at least a half-time basis (six credit hours). Repayment on the loan begins six months after the student graduates, ceases to be enrolled on a half-time basis, or withdraws from the College. Federal Unsubsidized Stafford loan is a non-need based loan program. Federal regulations require that a student complete a FAFSA before they can apply for an Unsubsidized Stafford Loan. Students are required to complete a separate loan application, and a Master Promissory Note, which is mailed to the student by the lender. Loan Limits for Subsidized Stafford Loan Students in the following categories are eligible to borrow the following loan amounts: Freshmen- $ (has earned 0-29 credit hours) Sophomore- $ (earned at least 30 credit hours) Students receiving an Unsubsidized Stafford Loan will have the interest accumulating but can request to have interest and principal deferred until the student leaves school or ceases to attend on a half-time basis (six credit hours). 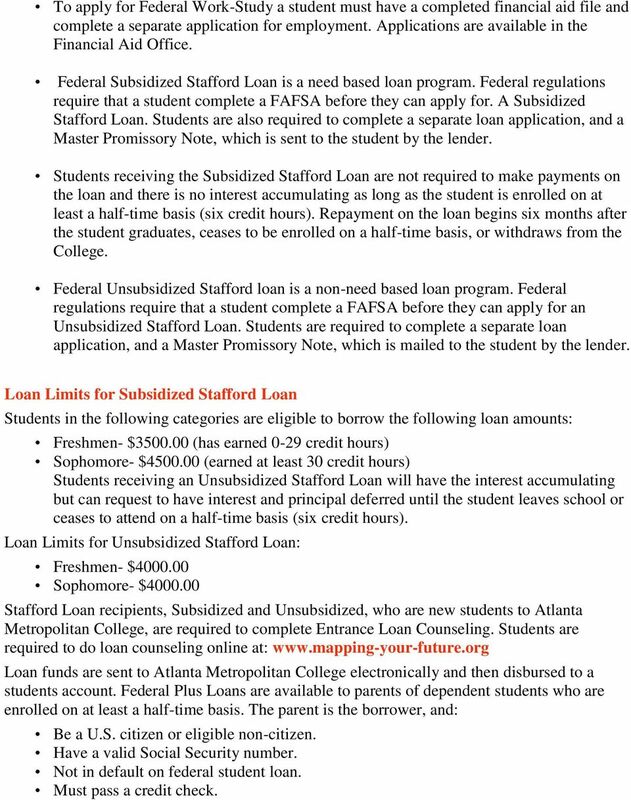 Loan Limits for Unsubsidized Stafford Loan: Freshmen- $ Sophomore- $ Stafford Loan recipients, Subsidized and Unsubsidized, who are new students to Atlanta Metropolitan College, are required to complete Entrance Loan Counseling. 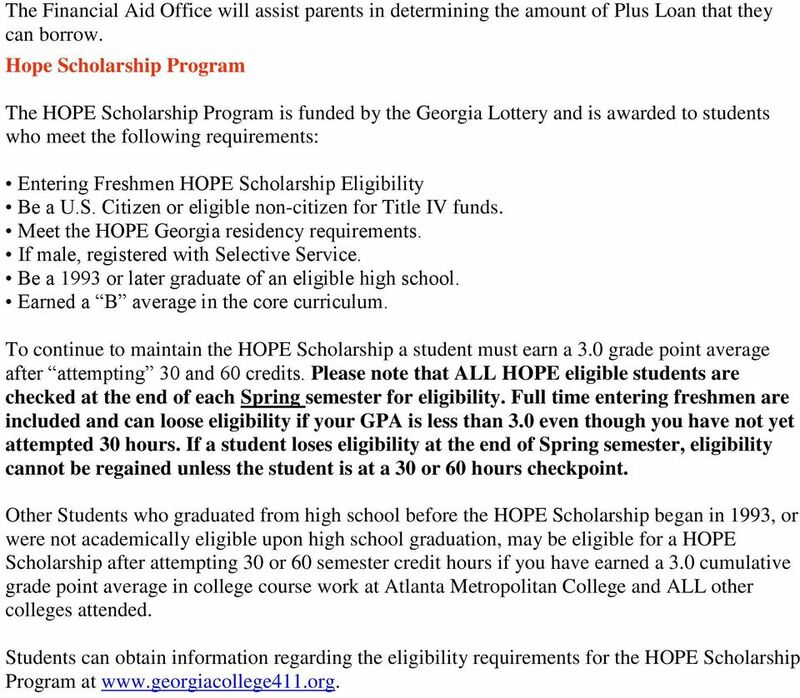 Students are required to do loan counseling online at: Loan funds are sent to Atlanta Metropolitan College electronically and then disbursed to a students account. Federal Plus Loans are available to parents of dependent students who are enrolled on at least a half-time basis. The parent is the borrower, and: Be a U.S. citizen or eligible non-citizen. Have a valid Social Security number. Not in default on federal student loan. Must pass a credit check. NEW JERSEY CITY UNIVERSITY Guide to Financial Aid Fastfact: NJCU graduates include a fashion magazine art director, a NJ Assembly person, a police captain, a news anchor and a corporate vice president! FINANCIAL AID How does it work for you?